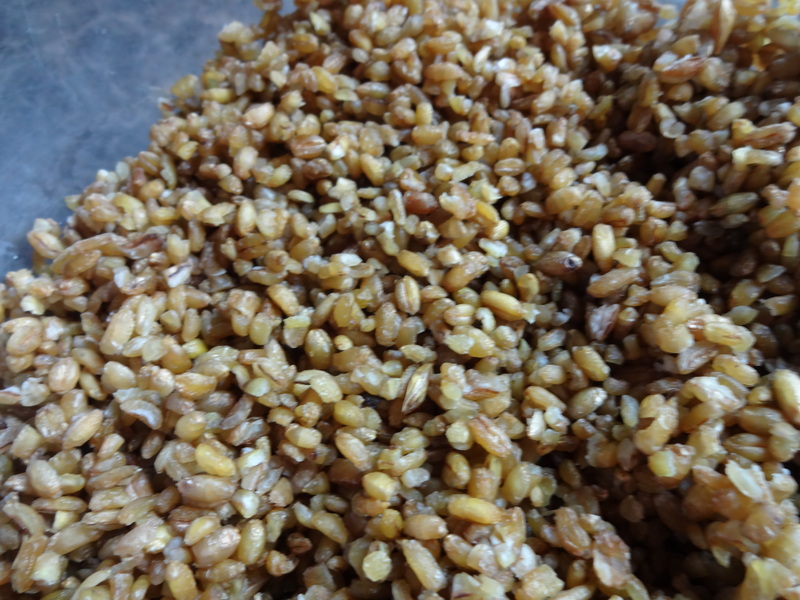 Freekeh has recently gained popularity in the US as a superfood. It’s low on the glycemic index, has three times the fiber of brown rice and twice the amount of fiber in quinoa. 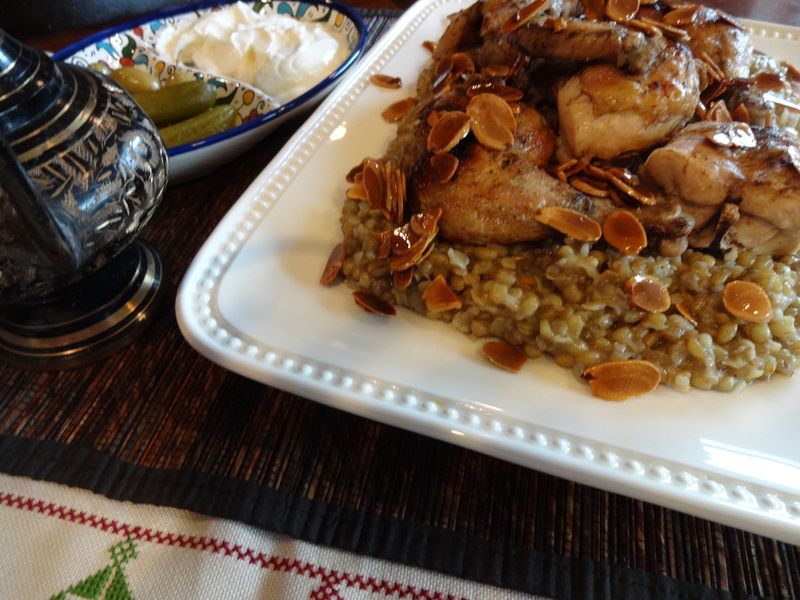 Serve mansaf freekeh with yogurt or salad. Sahtain! Rinse the chicken well, and put in a pot with the 5 cups of water over high heat. When it boils, remove the foamy layer of fat that bubbles to the top. Add the bay leaves, caradamon, and salt. Lower the heat to medium-low, cover, and cook for 30 minutes. 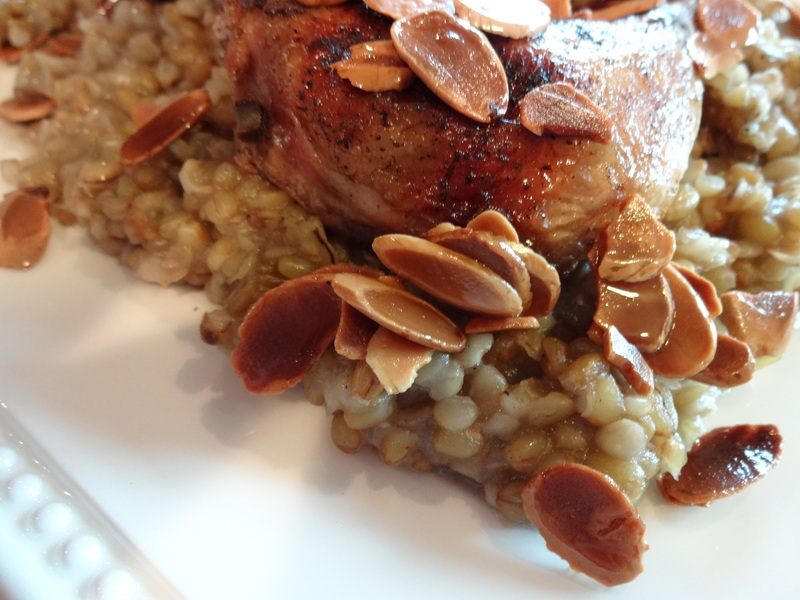 Set the chicken aside on a baking sheet and set the broth aside for use in the freekeh. In another pot add onions to vegetable oil over medium heat and add the rinsed freekeh. Saute for a couple of minutes, then add 4 cups of the fresh chicken broth. When it comes to a boil, reduce the heat to medium-low, cover, and let it cook until the broth is absorbed, about 30 or 35 minutes. In the meantime, turn the oven to broil, sprinkle the chicken with a pinch of black pepper, and place on the top rack and broil until the skin is crispy and golden. In a small pan, add some vegetable oil and sliced almonds over medium heat and saute until the almonds are toasted, stirring constantly. Once it reaches the desired golden brown, remove from heat immediately. Arrange the freekeh on a serving plate, top it with the chicken pieces and sprinkle the toasted, sliced almonds over the top. Serve with yogurt. First of all great website Rania!! I tried this recipe, followed it to the letter and it just turned out perfect! Thank you so much!